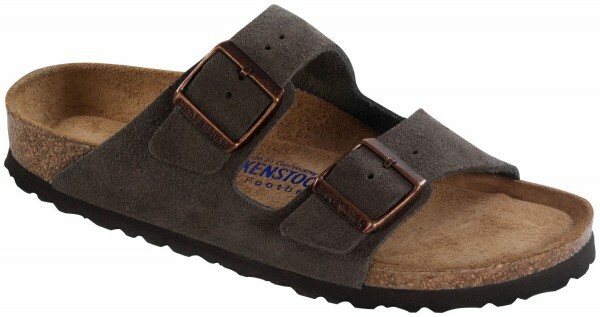 Product information "Arizona Mocca Soft Footbed suede leather"
The two-strap wonder from BIRKENSTOCK®. A comfort legend and a fashion staple. With adjustable straps and a magical cork footbed that conforms to the shape of your foot; a truly custom fit is as effortless as the classic design. The style Arizona is one of the most successful sandals ever. At work, free time, at sports and even seen on catwalks around the world the classic style of BIRKENSTOCK® made itself a great reputation as a high-quality product with lifestyle character. For particularly sensitive feet we offer some models with the added feature of our SOFT-FOOTBED, which Birkenstock® developed in years of intensive research. A foam cushion is inserted between the flexible cork latex mixture, coated in sturdy natural jute, and the suede leather cover sole.This layer is marked by an exceptionally pronounced recoil function, which ensures long-life padding. Related links to "Arizona Mocca Soft Footbed suede leather"
Customer evaluation for "Arizona Mocca Soft Footbed suede leather"